a lot has happened since I wrote my last post over, (ahem), four months ago. when I last wrote, I had just settled into a new apartment in the south end of boston–and apparently, that’s when the fall semester took ahold of me. I researched and wrote about bagels last fall, a lot of research and a lot of writing, which also meant I ate a lot of bagels. also, at the end of october, jon came to visit me in boston and we got engaged! so between the gastronomy program, wedding planning, the holidays, multiple moves, and now, the start of my thesis project, time has been flying by. this semester is my last in the gastronomy program at BU. in addition to my final project, I’m taking culinary tourism with dr. lucy long, which has been a great elective so far. it seems slightly fitting to my being in transition this spring too–with all of the moving around I kind of feel like a tourist myself. so, to fill in the spaces, after the semester ended in mid-december, I packed up my apartment with the help of my parents, and made the twelve hour trip back to michigan. leaving boston was definitely bittersweet. I have a lot of friends there and it was hard to say goodbye, but the prospect of finishing my thesis was also pushing me forward. in a lot of ways, starting my thesis has helped me realize how all of my work since the start of the gastronomy program last january has been leading me to this point. as to not to give away too much too soon about my project, i’ll say this much for now. I’m in san francisco part-time, (and in kalamazoo the other part of the time), and working once again with la cocina. I’m looking forward to being able to share more of my work later. on sunday afternoons, I have been enjoying making bread and other staples that can be used for meals throughout the week. this past sunday I made oatmeal sandwich bread, slightly adapted from orangette, and I will say it was the most successful loaf of sandwich bread i have ever made. It’s ever-so-slightly sweet, a tad dense, and really great for my lunch of choice, peanut butter toast. the loaf has almost lasted through the week; so adding it to the weekly sunday repetoire will work out nicely. the other thing I’ve been making a lot of is heidi swanson’s pizza dough, which I freeze in three or four sections and pop into the fridge as needed. since jon and I have been eating a lot of pizza, I decided to make calzones, instead. I bought pea shoots at the farmers’ market last weekend and wasn’t sure what to do with them. It turns out they make a pretty nice pesto. combine all of the ingredients in a food processor and pulse until finely chopped and smooth. the pea shoots I used had a pretty strong flavor, so I adjusted slightly with more beans, more rosemary, and a touch more salt and tasted again. you won’t use all of it for the calzones, so freezing a portion of it might be a good idea unless you plan to eat it some other time that week. combine the onion and squash on a baking sheet, and toss with olive oil. sprinkle salt and bake for 20-30 minutes at 400 degrees, until squash cubes are soft but don’t start to break down. set aside and allow them to cool. cut the piece of dough into two equal sizes. on a floured surface, roll out each piece into a square or rectangular shape, whichever you prefer for working in the filling. 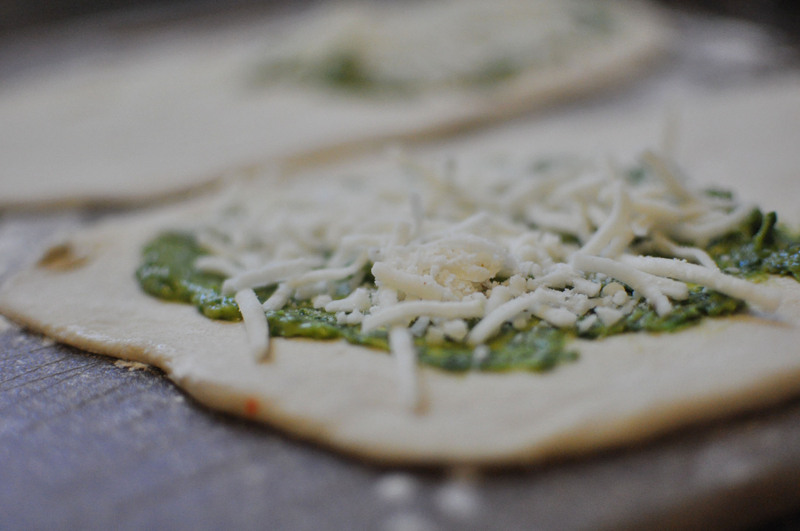 once they are rolled out, divide the amount of pesto, cheese and squash between the two. 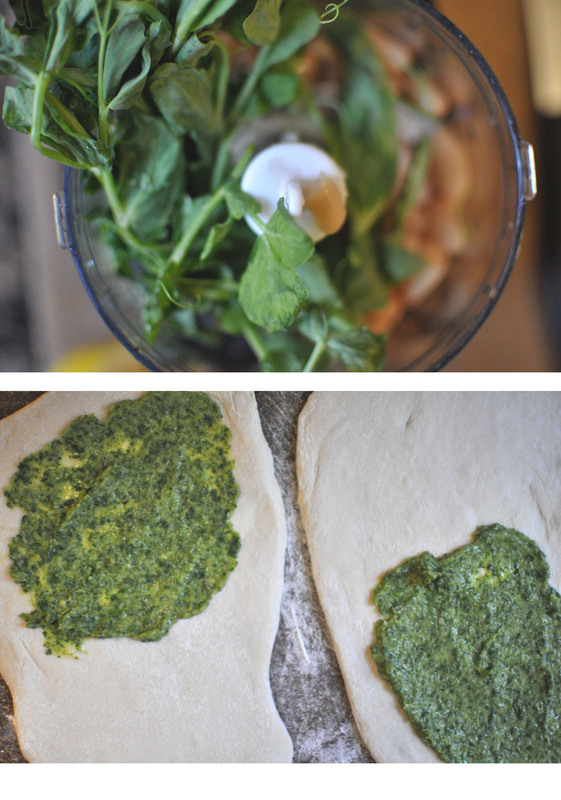 spread the pesto on one side of the dough, top with the cheese, finish with the squash and season with salt and pepper. fold the empty side over and pinch the edges closed with your fingers. brush with olive oil and create small slits in the top of the calzone to release steam. cook the calzones on an oiled sheet for 20 minutes at 400 degrees, or until the edges begin to brown and the dough is no longer sticky. Looks Fabulous! I am going make a spinach based pesto this weekend for freezing into cubes. I use them for individual portions of pasta or whole grain mixes. Yummy. Love seeing your blog again. looks beautiful and delicious! glad the almond cheese was a good sub! This sounds so delicious! Wishing you lots of luck with your thesis and beyond. Perhaps we’ll cross paths in SF one day. thanks kimberly! your blog is one of my all-time favorites. I would love to cross paths some day. The food looks wonderful, as always :) A huge congratulations on your engagement and all the changes that have been happening! Looking forward to hearing what comes next. My best to you and Jon! My goodness, you are the peripatetic scholar. Looking forward to reading what comes next.